Not feeling well, or just want to feel better in general? Before you reach for the medicine cabinet, take a closer look at what's in your fridge. You may find just what you need there. After all, before medicines were around, foods (and herbs) often did the trick quite nicely. In this post, we’ll explore the medicinal benefits of six amazingly healthy foods. Ready for some "food for thought"? Pomegranates were once considered the food of the ancient gods. Today, fortunately, they’re accessible to “mortals” like you and me. And best of all, they may help to reverse atherosclerosis. Pomegranates prevent cholesterol oxidation1 — a factor involved in plaque development. Beets are all the rage in juice bars, and it’s for good reason. They taste great, and they’re good for you. Beets contain nitrates, which relax blood vessel walls. If you’re a fan of the sweet and sour, tart cherries are your match made in heaven. Not bad for a tasty treat! Tomatoes aren’t trendy in the health food world, but they should be. One of their key antioxidants, lycopene, is a powerful cancer fighter. You probably know that yogurt is great for your gut, but did you know it’s good for your mouth too? But please skimp on the sugary yogurt cups. The sugar is anything but good for your teeth. Cabbage juice isn’t the tastiest drink around, but it seems totally worth it. Next time you have a cut, think honey, but don’t go for the conventional kinds. There are preparations specifically made for wound care. Hippocrates was onto something when he talked about food as medicine. Fast forward hundreds of years later, and we’re doing the same thing. 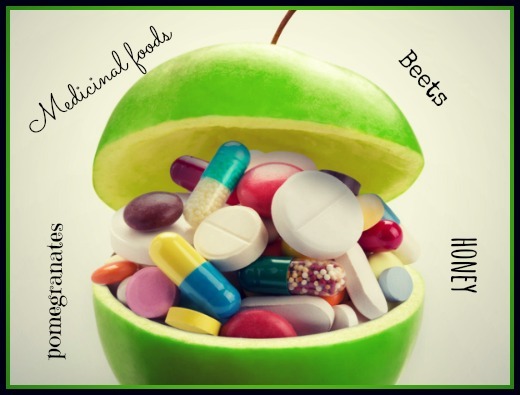 What’s your favorite medicinal “super food”? Please let us know in the comments! Eur J Nutr. 2012 Dec;51(8):909-16. Exp Biol Med (Maywood.). 2002 Nov;227(10):886-93. Aust Dent J. 2008 Dec;53(4):314-9. Available at: http://jocpr.com/vol4-iss1-2012/JCPR-2012-4-1-209-215.pdf. Accessed July 15, 2013. Calif Med. 1949 January; 70(1): 10–15. PLoS One. 2013; 8(2): e55898. All of the above are great in green shakes and so good for you I don't know about Manuka honey but will check it our. Thanks for sharing. Nancy Moody - It's our pleasure. Thanks for reading! Thanks for providing the great list! However, I was wondering what your thoughts on garlic were? From my research, this seems like one special food! In fact, I just recently read about a study which suggested that eating raw garlic twice a week could protect the body from lung cancer. Stephen in Orlando - Garlic is a good one! It's definitely part of the "must-eat" list. I can vouch for the manuka honey and pomegranate. Both were used to heal a deep wound I had on my leg. Tu dieta disociada- Thanks for reading! Dexter R Swain - Thanks for sharing! I heard about Cabbage juice this morning on Fox News and was looking for some info when I found this article. Thanks for confirming its use. I enjoy and learn from following you on Twitter. Excellent Post...Diet meals represents any meals or consume whose formula has been changed in some way to make it part of a body adjustment eating plan. I have gone through this article and it is really very informative about the proper dieting foods. Dieting means not reducing the amount of foods you eat, its about taking proper food materials. This blog providing the proper information regarding the medicinal foods for dieting process. Thanks for this article. Clifford - Right! Dieting is about making the right nutritional changes in your life, not about restricting calories. I wonder if fermented cabbage is just as healthy as raw..like some home made sauerkraut. Losing weight gradually is much better than losing them instantly and gain weight again. This is a great method of dieting and very effective. Thanks for sharing your inspiring post. Sauerkraut is very good . Due to the fermentation process it contains a healthy supply of natural probiotics. When buying it in the store you should check that the only ingredients are cabbage and salt (but it's unlikely to be sea salt).Homemade is better, as you can choose to use the healthier sea salt rather than regular table salt. It's recommended in the Budwig anti cancer diet. Amazing healthy food. Thank you for sharing. I agree that food is an excellent way to get what our body needs. Como bajo de peso - Our pleasure! When i consumed my breakfast in the morning took usually grapefruit has prpiedades very incredible medicinal is effective against the extrenimiento, cleans the body of the toxins effective fat burner, etc. i am usually eating fruit but now that you know that I recommend to eat but with respect to plant ? Usualemente soy de comer frutas pero ya que sabes ello que me recomiendas para comer pero con respecto a vegetales ? Green and dark purple Veggies are the super foods ; plus red and dark colored fruits helps to stay healthy and younger even at mellow age in Seventies. Libro Factor Quema Grasa funciona- Thank you so much! We're glad you enjoyed the post & we truly appreciate your support! afiliado sussa - You're welcome! Thanks for stopping by! I read through this articles. This is very helpful. This is all dieting food & they are very effective to reduce weight. We should follow this tips. Already I am taking this 6 medicinal foods with my dieting plan. And thanks for your blog post. Elizabeth WMcGlone - Awesome! You're very welcome. Why are you recommending the dairy product of yogurt, when all of Life Extension's magazine articles say that dairy is a poison that causes cancer and cardiovascular disease? Why are the dates on the comments invalid? Some dates go back as far as 2013, when this blog post was just mentioned yesterday on Life Extension Twitter. Are We Getting Enough Nutrients from Food? Does Stevia Have Health Benefits? All Contents Copyright © 2019 Life Extension® All rights reserved.